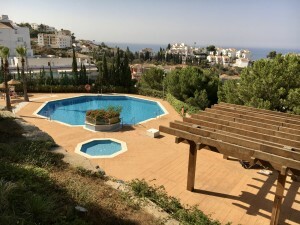 This spacious luxury villa is situated 900 meters from the beach in Benalmadena Costa and offers every imaginable luxury from a large heated swimming pool (50 m2) with separate jacuzzi to a stainless steel Boretti kitchen with wine cooler, 3 ovens, 2 refrigerators and a remote controlled extractor which disappears into the ceiling. The villa consists of 3 floors. The main floor offers an impressive entrance hall, a large and bright living/dining area, a fully fitted kitchen and a bedroom with ensuite bathroom. 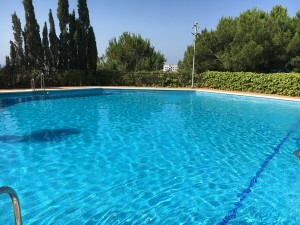 This floor has direct access to the swimming pool area with both covered and open terraces and a private green to practice your putting skills. Upstairs you will find 3 more bedrooms with ensuite bathrooms and downstairs you will find a large 2 car garage with storage room and bulletproof entrance door. 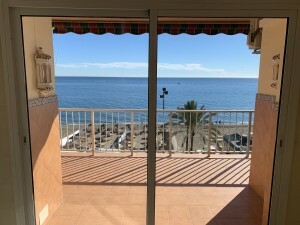 A lift connects the three floors of the villa and security has of course not been forgotten - with a modern camera equipped with motion detectors. Top quality blinds from Italy. Luxury wood and travertine stone on walls and floors... Every detail of this villa is absolute top quality. Plus, the villa is built on a double plot of over 2,000 m2. 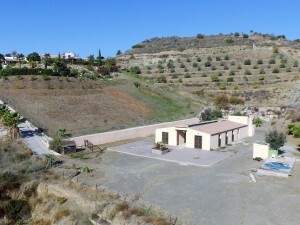 Half of the plot is situated behind the villa and can for instance be used for a tennis court or to build a second property (subject to building permission).